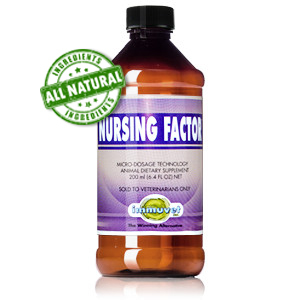 Weaning Factor™ helps boost immune function, and avoid the slow-down of growth caused by stress during this traumatic stage. Weaning is a very stressful and traumatic emotionally and physically for the foal. At this point the foal’s defense system is severely affected and needs all the help it can get to maintain its overall health condition. 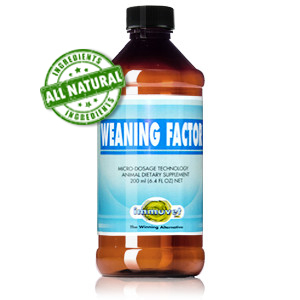 Weaning Factor™ helps boost immune function, and avoid the slow-down of growth caused by stress during this traumatic stage. At this point the foal’s defense system is severely affected and needs all the help it can get to maintain its overall health condition.Weaning Factor™ is excellent for foals of all breeds, independent of whether you are raising them for personal pleasure or for profit. You will be amazed by how easy it is to use and the great results obtained when you give your foals Weaning Factor™. If you have not used it yet, you have yet to see how your foals will walk away smoothly as they are separated from their dams. Although they will still feel, and in some cases, some foals may act nervously about what is happening, their strengthened immune system seems to drive confidence into their organism. They will look healthy, strong and resistant. In addition to this more hassle-free weaning process, you will easily notice in your foals that Weaning Factor™ helps regulate these youngsters’ immune system. It is very common to have foals experience diarrheas and respiratory problems after weaning. Weaning Factor™ acts almost as a dual-purpose supplement by helping: ” To prevent disease penetration since the immune system is highly boosted ” The foals to take better advantage of the nutritional factors in their feed A 3-year field study has proved Weaning Factor™ to be inexpensive and highly efficacious at Winding Oaks Farm in Ocala, FL. The number of foals supplemented with Weaning Factor™ in this trial increased progressively and now all the Winding Oaks foals are using it. Winding Oaks Farm knows that Weaning Factor™ is its foals’ best cost-effective preventative program with substantial savings in stress, physical trauma, and weight loss. 10ml oral of Weaning Factor™ per foal on a daily basis, 10 days prior to and 10 days after weaning. Shake bottle 10 times vigorously before drawing each 10ml dose (every time you use it). We strongly recommend administering the dose under the tongue to allow for maximum absorption. USA Pricing only. For International Prices, please contact us. We only ship within the USA. For International shipping, please contact us.